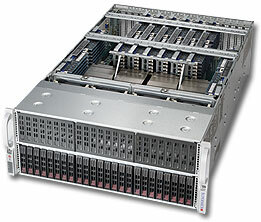 ■ Cost-effective, bare-metal infrastructure for data center racks. ■ 1 GbE connection to server and storage nodes in rack, with 10 GbE uplinks to spine network. ■ 48 x 10/100/1000BASE-T RJ-45 ports. ■ 4 x SFP+ uplink ports, supporting 10 GbE (DAC, 10GBASE-SR/LR/ER/LRM) or 1 GbE (1000BASE-T/SX/LX). ■ 1 x 40G QSFP port on the optional module supports 40 GbE (DAC, 40GBASE-SR4/LR4) or 4 x 10 GbE (DAC or fiber breakout cable). ■ Full line-rate L2 or L3 forwarding of 336 Gbps. ■ Support hot/cold aisle with port-to-power and power-to-port airflow SKUs. ■ Energy efficiency: 122 W typical power consumption. ■ Hot-swappable, load-sharing, redundant AC PSUs or -48VDC PSUs; or 12VDC power input. ■ Hardware switch pre-loaded with Open Network Install Environment (ONIE) for automated loading of compatible independent SwitchOS software. ■ Compatible with Cumulus®Linux® r2.0 and later SwitchOS software from Cumulus Networks™. ■ Compatible with SwitchLight™ v2.1.0 or later from Big Switch Networks. The AS4600-54T is a high-performance Gigabit Ethernet Layer 3 switch, with 48 RJ-45 GbE ports, 4 x 10 GbE SFP+ ports, and two module slots each with 40 GbE bandwidth for additional uplinks. The switch provides the high-availability features required in a data center top-of-rack switch, including redundant hot-swappable AC or -48VDC PSUs, or 12VDC power input; hot-swappable redundant fans, and port-to-power or power-to-port airflow options. The two expansion module slots accept 1 x 40G QSFP modules to provide two 40G ports or eight 10G ports through breakout cables. This additional bandwidth makes the switch ideal for applications mixing 1 GbE and 10 GbE nodes in a rack, or to support 40G uplinks to a spine network.